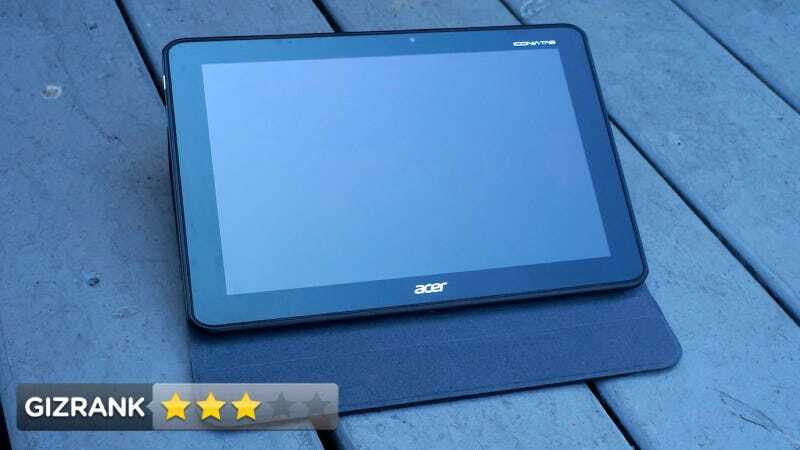 The Acer Iconia Tab A510 was a decent tablet, but the screen was lame. The new Acer Iconia Tab A700 is essentially the exact same tablet, but with a 1080p screen. Purty! But how do those extra pixels affect the performance? A 10.1-inch 1920 x 1200 tablet running Android 4.0 (Ice Cream Sandwich) on Nvidia's 1.3GHz quad-core Tegra 3 processor. This thing was built for movie watching. The 16x10 screen is the same size as the A510. It's thicker than the Transformer Prime or the iPad. There is a micro HDMI out, a micro USB out, a nice pair of Dolby speakers, and a rubberized back. The Tegra 3 powers through most uses, but it does struggle in places the A510 didn't. The screen is better than the first two iPads (and the A510), but not as sharp as the new iPad display. Gotta go with the screen. It's really pretty. The whites are whiter, the blacks are deeper, and the colors really pop. The additional pixels slow down the overall experience. It feels slower than the A510, even if the benchmarks measure them as even. The touch screen response lags and trips. This could cost you your life (in a video game). The 9800 mAh Li-polymer battery gets insane standby times and over 10 hours of usage. Playing the game Oscura on the A510 was smooth, but on the A700 it seems to play at half speed. Buttons presses get missed. It turns into a bloodbath. The optional protective case is nice—it won't automatically turn the screen off like the iPad's does, but it's thin and grippy. Acer put a twist on Ice Cream Sandwich by adding the Acer Ring (pictured), a customizable shortcut launcher that you can pop up from anywhere in the UI. It's pretty, but you'll almost certainly never use it. At 1.43 pounds, it's lighter than the A510, but it still isn't light. At .43 inches, the thickness feels heavy. It's blocky, and not fun to hold on the subway. It comes with a little micro USB-to-USB adapter so you can plug in a jump drive, or a USB keyboard or mouse. Handy, maybe? Acer loads this thing up with tons of bloatware—close to a dozen programs you'll probably never use. It's enough to make a brand new tablet look cluttered right out of the box. Probably a pass. What the A700 gained in screen quality it seems to have lost in performance, keeping it right at the three star ranking. At $450, it's certainly not the worst deal out there, but the Nexus 7 is only $200—and buttery smooth by comparison.